Did you read the title? While it’s definitely a tongue twister, it’s truth: Premature anything in sales is a BAD practice. Unfortunately, premature proposals promote poor performance way too often. After final comments and a promise on a delivery date, click. The seller is happy because they think they have a sale in the works. They may even tell their sales manager that a sale is imminent because the prospect asked for a proposal. Why? The buyer just gave you an assignment with NO commitment on their end to do anything. How much time will you now invest in putting together numbers, information, and materials to send to a passive audience? Whether it’s thirty minutes or many hours, it’s too much time at this point. What a waste of effort/labor if we aren’t in alignment with the buyer’s decision making process and they are making small commitments to decisions or actions along the way. Compare it to what they already have and decide there is nothing compelling in it to even talk about with you again. Thus, no response to your dozens of “check in” emails and calls. Share the proposal with their current supplier to match pricing. Now your competitor has your details as well to use against you. Become confused as they aren’t sure what was proposed is right for them or there were too many options to sort through. Often our biggest competitor is “nothing.” Its always easier for a prospect to do nothing, and that’s what they will do, nothing. Decide to talk with you again if you catch them at the right time. That’s the action you really want. That’s only a 25% chance of the action you want, isn’t it? Not very strong odds! We need to increase our probability of a better response and leverage the time and effort it takes to put together a proposal. Proposals created at the right time to collaboratively engaged prospects increases your probability of a sale moving forward to a close. In a recent sales situation of mine, after just one short phone call, a prospect asked us for a proposal including – our approach to solving his problem, timeline, and a price. He didn’t have a budget, know what a reasonable fee for his custom project would be, and had an unreasonable expectation of timing for delivery. He was intrigued on how we could help him actually get the information he would really need to gain approval internally and move forward with his much-desired project. He even mentioned that our approach was different than the other potential companies he was talking with. I needed to keep my excitement about the possibility of a big sale out of the equation in order to not skip steps in the sales process. The key was not proposing a recommendation with pricing to an unqualified prospect. He had never bought this type of custom service before; and our ability to prep him along the way so he could get approval for what he wants gave him value he wasn’t expecting, differentiated us from the competition, and saved us a lot of time and energy along the way. Say “not yet” if you are asked for a premature proposal. Though we need to align our sales process with the prospect’s buying process, we can say “not yet” And explain when it will be most beneficial for them to get a proposal (when they will get the information needed to make a decision). Qualify the buyer and the opportunity first. If you don’t know budget, decision process, decision makers, and desired outcomes, you don’t have a qualified buyer and your efforts have a lower probability of a closed sale. Only agree to create proposals for prospects who take the next step with you. Ask for commitment to the next meeting to review the proposal. If they won’t agree to a next time to talk, they are not engaged and are just fishing for information they can use for their own purposes. Send a “discussion draft” for a complex solution. Using all the other tips as well, if the solution is complex with many variables or options, make it a “discussion draft” and explain to the prospect that this is preliminary andthat a collaborative discussion is necessary to identify the best solution and applicable investment for them. Gain agreement on as many of the details as possible before putting it in writing. Often we can get a preliminary agreement on quantity, timing, implementation, and even pricing before committing details to writing. Proposals presented properly promote powerful and positive performance. The tools, tips, and process from Conversations That Sell builds Skill and Will when put into practice. Need help implementing the best practices in a collaborative, interactive, and accountable way? 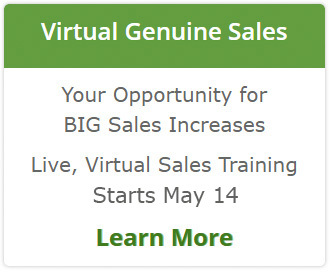 Click here to learn more about the sales training course that will help you be more productive, increase your close rates, stop discounting, and sell more consistently. Great and timely article, Nancy – spot on! I thank you for it. How long have I been involved in sales without giving this issue enough thought? No comment. Thanks for writing this!